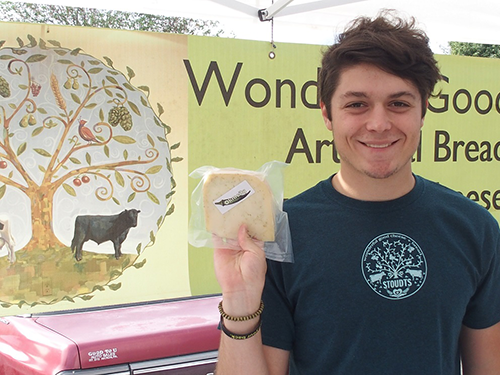 Stoudt’s Wonderful Good Market has been a full time vendor and a customer favorite at the Antietam Market all summer. Late risers coming to Saturday’s summer market could usually find themselves staring at Stoudt’s empty table. 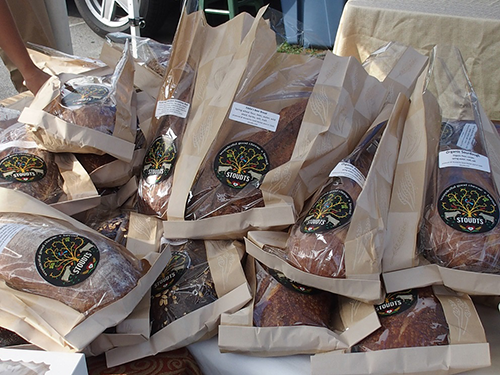 Breads, cheese, crackers, and scones sold out quickly proving how much our community loves Elizabeth Stoudt’s talent for making a wonderful good product. Elizabeth grew up with her four siblings in the family business and wore many hats as the daughter of Ed and Carol Stoudt. What was started by her parents as the Black Angus Restaurant and Pub in Adamstown soon incorporated a beer garden and festival. Their love of heritage led them to then establish Stoudt’s Brewing Company. Having grown up in a fermenting family, it seems only natural that Elizabeth turned to a different sort of fermentation by making bread and cheese. While she attended the Vermont Institute for cheese making, she is self-taught when it comes to bread. Not surprisingly, beer is an ingredient in most of the recipes. On an average production day they hand weigh over 300 lbs. of dough. A cheese production day finds Elizabeth working with an average of about 1300 lbs. of milk from 4:30 am until 6:30pm. 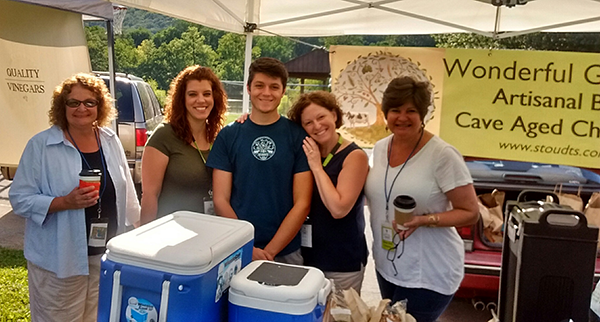 Market ladies (from l to r) Deb, Rachael, Denise and Margaret (Michelle on vacation) say goodbye to Our Ethan, Stoudt’s Wonderful Good salesman of the year. Ethan is a student at Penn State. Can’t get enough of Stoudt’s Wonderful Good Market? You can find them along Rt. 272 in Adamstown. Visit their website at www.stoudts.com for directions, hours and a delicious menu that will make your mouth water. Pumpkin Lager Bread Pudding, anyone? Elizabeth reflected, “The reward of what we do here is having close contact with our customers. We have an open bakery so people can watch us roll soft pretzels and see whatever is coming out of the ovens from biscotti and scones to Christmas cookies and fresh baked bread and cheesecakes. We have windows into the creamery so people can see our facility anytime and the hundreds of cheeses aging in their humidity and temperature controlled rooms, which we fondly refer to as our caves. Stop by Stoudt’s Wonderful Good stand as they close the summer season of their Green River and Thread Bread, and replace it with Pumpkin Apple Beer and Caramel Apple. Elizabeth Stoudt may even have German Stolen for those of us who are early risers!